Here is something that I just HAD to share with you. The other day I bought some expensive Safflower oil so that I could add another layer to a semi-dry oil painting. I know that if I need to add another layer I have to observe the "fat over lean" rule - which means adding oil to the paint to make it fatter and to slow down the drying time. This is to make sure that the layer on top doesn't dry before the layer underneath, which can cause cracking of the dry top layer as the wet underneath layer moves during the drying process. It's especially important when adding highlights with titanium white as it is notorious for drying quicker than other colours. I chose Safflower oil as it doesn't cause yellowing of the pigments over time. 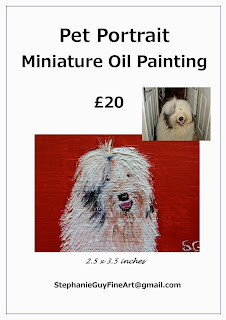 Whilst I was mixing my colours and adding the safflower oil, I noticed that the oil was actually cleaning my brushes! I DON'T NEED TO USE SMELLY HARMFUL TURPS TO CLEAN MY BRUSHES!! I had already made the switch to using Zest-it Sovent instead of artist turps for health reasons, but even that has an overbearing whiff that I could happily do without. So now I keep a small bottle of regular everyday cooking oil in my kit for cleaning up my brushes and my palette. 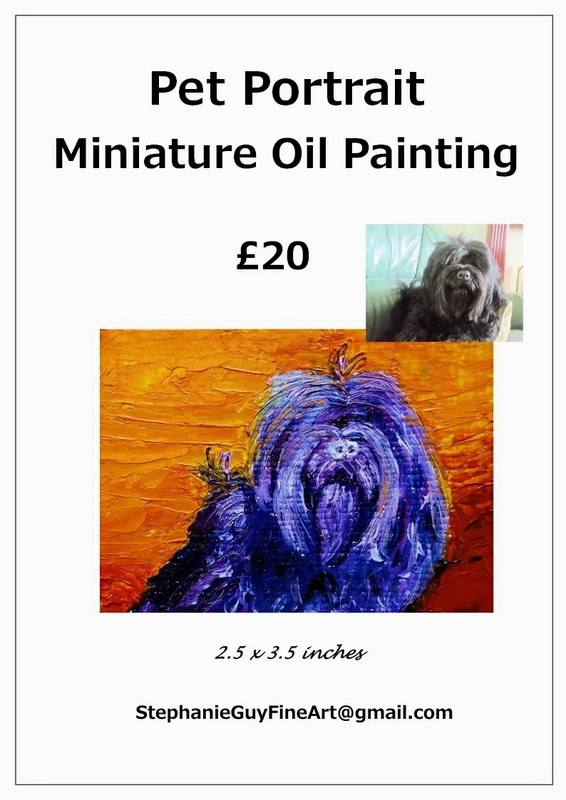 And I can paint miniature pet portraits to my heart's content! 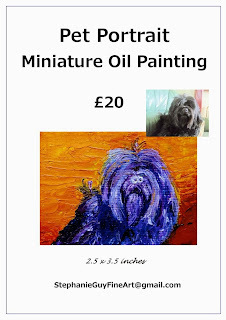 These are just 2.5 x 3.5 inches, perfect for displaying on a mini easel or for carrying around in your wallet to show your friends.